Buy your Joseph Communications book now. For North American customers all our books are now available from Amazon U.S.
Everything that Joseph says seems so logical and makes so much sense – I feel that I am on the right path at long last and it is all down to Joseph’s books. The Joseph books have meant so much to me. They seem to piece together into one picture all the knowledge I have gained in a lifetime, as well as giving it a clear, relevant & meaningful context and I am ‘eternally’ grateful to Joseph (pun intended) for giving us the tools to recognise Light and to learn how to use it. The Joseph Communications are a fascinating insight and a point of view I had never heard before. Anyone interested in spiritual growth will enjoy the Joseph books. These are some of the most powerful books I have ever read, and I wish to thank the Band of Light for bringing them into being. You have no idea how many lives you have touched and changed with your powerful and beautiful books. They truly are a revelation! Incredibly enlightening and life-changing – a gift to have come across this information. Thank you for putting it out in the world. I feel such a relief in the sense that a) so much about the world’s brokenness makes sense to me now and b) Joseph is giving us tools and guidance as to how to lay down so many burdens and resist the Field, and how to change and help others and evolve ourselves and the world by sending out love and Light. I do find his teachings are helping me to see the “wider picture” of life in a broader way. I found the Joseph books to be life-changing. Joseph’s messages are quantum levels above any other source of Light that I have encountered. I have tried his suggestions to ‘Use the Light’ and ‘Put Light into everything we do”. And I have found out that IT WORKS. Real problems are just evaporating from my life. Daily events are working out beautifully. I have energy that I do not know where it comes from. I’m so glad to have discovered the books, they’ve really changed my outlook on this life and what lies beyond. Brilliant information, spread the word – more people need to know about these books. ‘I’m very grateful that I found this message- it’s bringing me back on track. Looking for solutions in the outside world for at least the last five years, I completely forgot about the power I have to change myself and the world. There isn’t a single day that I don’t think about Joseph’s message. I always feel uplifted after I read his words. I base my trust in Joseph on his down-to-earth practical approach to living positively and from the heart. A friend suggested the books to me as she had a profound realisation after reading them – they showed her the difference that made the difference. To Michael, Jane and the Band of Light team – thanks for bringing the world the Joseph Communications – they’ve had a profound effect on the way I think about life and why I am here. The books truly shock, amaze, educate and comfort in equal measure – they set people free. I have been overwhelmed by Joseph’s words in all his books. Everyone should read all of the Joseph communications as I have. They will change your life and show the way, the truth, and the Light through Love. The books are amazing and my life has changed above and beyond anything I expected. They confirmed and consolidated so much that I felt and thought even as a young child and I feel blessed and grateful that a friend recommended them to me. I am very happy to have got to know Joseph – he has enriched my life. I recommend the books to anybody who is in despair or searching for deeper and greater knowledge. These books are the best I have ever read on this subject matter and have changed my view and approach on many issues for the better. I am finding so much in the books that confirms what I’ve been thinking and feeling for so long, and they encapsulate so much real truth that they make all my other books seem irrelevant. Joseph’s love of God, nature and humankind – coupled with the humility that only highly-evolved souls are capable of – is truly inspirational. ‘I am so impressed with the books. It’s given me a totally different outlook on life. The books make my heart sing. The Joseph communications have woven together 20 years worth of ‘education’ in a way that makes total sense to me. I have told many people about them and have incorporated so much of the information and exercises into my own life. Thank you. This is my favorite series of spiritual books ever and there is information in these books I’ve not come across in all the other spiritual books and series I’ve read. Definitely must reading! I finally feel I have a little spiritual family through your website and don’t feel quite so lonely on this mortal plane anymore! I have searched for 75 years for the answers and finally, thanks to Joseph, I’ve got the answers. Joseph’s books made me take stock of my life and the way I live it. Every day I meditate and send out Light and I have had some lovely signs that I am on the right path! Thank you all for all your hard work, the books have changed my life. The teaching has helped me tremendously in my spiritual growth. I have bought many books from you to give to my patients. I can’t praise the information enough. It all makes perfect sense to me. Thank you all once again for your dedication in bringing this information forward into the public domain – we desperately need all the help and guidance we can get in these ever-changing and challenging times. Let’s all hope that we can do enough this time to make the shift. With all my heart, thank you for bringing such Light and truth to people like myself. Joseph is in my mind every day now and continually inspires me to send out the Light. It has had wonderful results so far in helping friends and family and I’m truly grateful for this. Every subject Joseph covers resonates with truth. The teachings are so awesome and just what I have been looking for for so many years! I have what can be described as a ‘library of spiritual books’ but now just wish to read the Joseph books over and over again. Awesome and essential reading! The Joseph Books are as a message from God for us all to awaken to who we really are and tells us how to very simply change the world! To know the truth is such a relief, like a re-birth, a re-connection to God, which totally changes one’s perception about everything. It feels so important that everybody has the opportunity to read Joseph – so beautifully channelled by Michael for all of us. I have been searching for over 65 years and I feel, hearing Joseph speak I haven’t wasted those years – makes the Light shine a bit brighter. I feel the Joseph group is around me when I read the books, so I read them over and over and over again. It gives me the feeling of being with family’. The information brings together so much in relation to my studies, questions, thoughts, feelings throughout my life. I work in the area of religion/spirituality and am both astounded (yet not!) and deeply heartened by the message of Joseph. Thank you. When I read Joseph’s books I feel like I have come ‘home’ – I so enjoy them! The Joseph books have been a source of great Light, Resonance and Transformation for me – thank you for bringing them into the world. The Joseph Communications literally feel like a ‘gift from the gods’ because they are so clear, precise and specific and the truth is so apparent in them. The information that Joseph is giving us is vitally important, and the books have already had a major impact on my own thinking. These are simply life-changing books. The extra knowledge one gains through reading them is priceless. I suggest that every medium should read them also to add to their own knowledge. The books are superb – I have searched for such for over forty years. I have waited so long, just like many others, to hear the words of Joseph …or to put it in another way – the word of truth. Thank you for bringing such important information to the world – I know my journey and evolution involves remembering who I am and what I can do. I cannot tell you how happy I am to have discovered the Joseph material. I now feel at long last, through Joseph’s instruction, I can do something personally to help change things for the better for our planet and ourselves – God knows we need to! These books are truly life-changing and are a real wake up call to all of humanity. My friends and I are making a conscientious effort to send out love and light to the planet and the souls that dwell upon it. I have read several spiritual books, most of which I have since thrown away as they didn’t resonate ‘the truth’ to me but I have read all Joseph’s books and his teachings made absolute sense to me – for the first time in my life I could relate to what was being said. I cannot begin to tell you how much it has changed my life (and I am sure many others) for the better. Joseph’s words are truly awesome and amazing. I always read at bedtime before going to sleep as I find the impact much greater and I find myself waking the next day remembering Joseph’s words, which enables me to put them into practice, or think about them deeply during quiet moments in the day. Each book has provided such wonderful food for the soul. So much more revealing of the truth than anything I have read before. I have been seeking answers for many, many years, and have always known that the answer to change in the world was very simple, and Joseph confirms that. It has greatly shifted my perspectives on this earthly life, as well as confirming so many things I’d felt, but had not found any confirmation for from other sources. It is really powerful and among the strongest communications from spirit I have ever read! It doesn’t offer any placebo as I feel some do or skirt around the very difficult challenges of being human and our current situation. Joseph’s information is succinct, clear and powerful. The Joseph Communications resonate on a soul level. Joseph is the only one that is giving people the answers to change the world – and themselves in the process of course! Books like this have been my passion for a long time and I have an extensive collection, but none have resonated as strongly with me. I’m an enthusiastic Christian attending a local church. Normally such people are a bit unsure about reading books like the Joseph ones in case it conflicts with their beliefs but I have found them excellent. A friend of mine told me about Joseph and that these books spoke to her in a way that no others had. Joseph’s books are like Bibles for the modern age. The Joseph communications have opened up the essence of who I really am. I have a little healing circle of friends and we do all send light into the world and to the Field everyday. The books have been inspirational and helped give some structure and consolidate the little bits of knowledge we had. Joseph’s teachings resonate deep within my soul. There is hope where there was once despair and there is clarity where there was once confusion. Joseph’s inspiration and enthusiasm is infectious. Thank you, Joseph, from the bottom of my heart. I have shelves and shelves of books on spirituality that I have read over the last 30 years. It is as if I have been putting a spiritual jigsaw puzzle together and Joseph’s books put the final pieces in place and at last I can see the whole picture. Unless Joseph has another book I will not be buying any more books on spirituality as I don’t need to. Joseph’s books are just amazing and I have learnt so much from them and am reading them over and over again and each time learning something more. The Joseph Communications are amazing. They are the channeling of a ‘collective consciousness’ of souls on the other side. The information that is shared is interesting, needed and oftentimes mind-blowing. I highly recommend them. I have read too many spiritual books to count and I have never came across a communication like this. Every single word in the Joseph Communications resonates with me deeply, I know without a doubt that the source of these communications is Divine in every sense of the word. I am so grateful to Michael and Joseph for bringing this heart-warming message to us all. "You have the power to change you and to change the world around you." 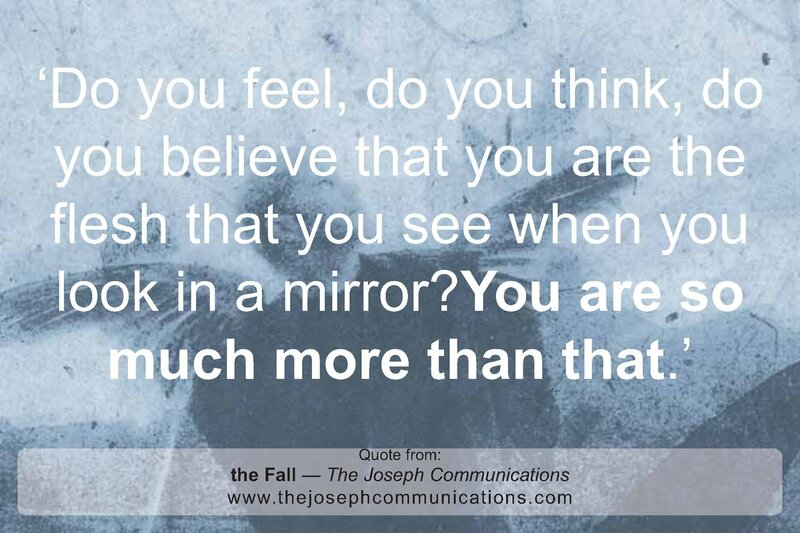 the Fall - The Joseph Communications.